In the 1960s it was possible to follow a chain of footpaths from the north of Sutton through the Sutton countryside for ten miles, ending near Minworth. However, by 1985, when this route was being enhanced and designated as the Sutton Byway, the area round the first two miles of footpaths had been built up, and this section of the chain was excluded from the byway. Walkers can still follow this two-mile section, but the only countryside is where it passes through the Hill Hook Nature Reserve. The focal point of the nature reserve is Hill Hook Pool. The pool was made as a reservoir for a water mill established here in the sixteenth century, grinding the grain grown in the fields north of Mere Green. 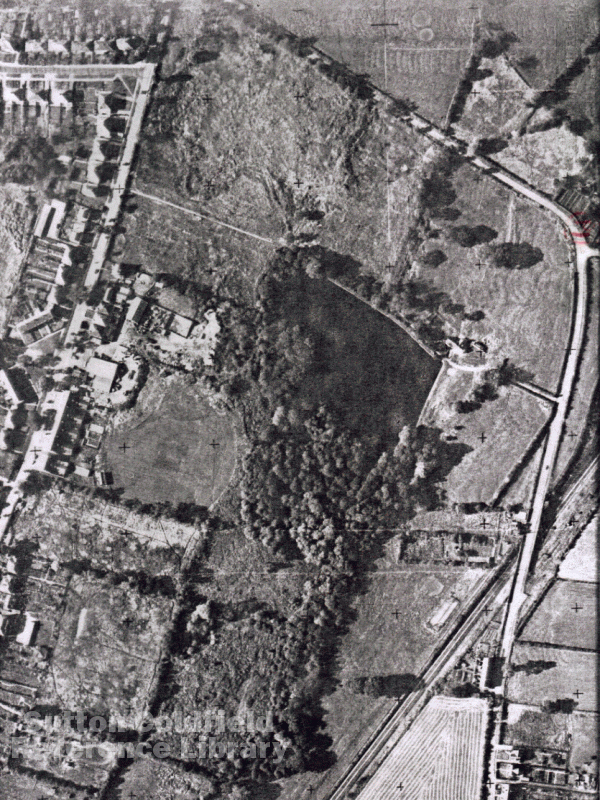 The footpath runs along the dam of the pool to the site of the water mill - the mill and the miller’s house were demolished in 1970. It was not until 1986 that the pool was reinstated with a new dam, and the area was landscaped. The site of the mill was preserved as a garden featuring a millstone and a cogwheel from the mill set in concrete surrounded by low walls built on the foundations of the mill, with an explanatory plaque. The mill was owned originally by the Warden and Society, that is, the Corporation of Sutton, and successive tenants over the centuries found that they could barely make a living from milling, and took up farming on a small scale to make ends meet. The mill was often in a poor condition: a valuation of 1856 described it as “Mill - ruins”, and it needed extensive renovation in 1861. By the early twentieth century the mill was no longer viable, but it became a visitor attraction. The miller (who lived in the adjoining cottage) would set the machinery going for visitors, with picnics on the slope above the pool; there was fishing, boating and swimming in the pool, and there were swings and roundabouts in the top field next to Hill Hook Road - it was a popular destination for Sunday School outings with Blake Street Station nearby. The chain of footpaths led along the access road to the mill to Hill Hook Road, but this section is now built up, and the path leads to Netherstone Grove (the millstone displayed at the mill site is the bottom stone of a pair, technically a netherstone) and so to Hill Hook Road.